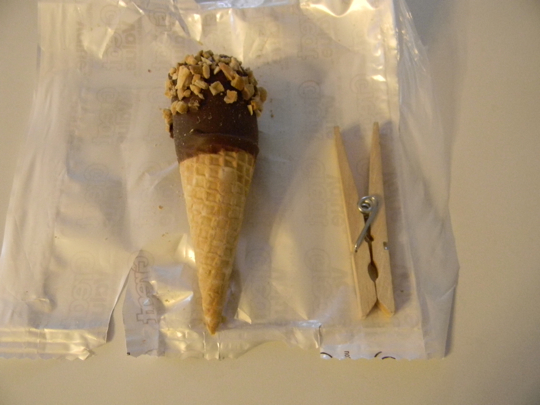 I have said before how much I like Drumsticks ice cream treats, but the regular size are such a big commitment. If you decide to eat one, you get pretty full and that’s it. if you buy the mini-size that they sell at Wal-Mart (store brand, but of respectable quality), then you can have one before dinner and after! Even one while making dinner if you’re feeling ambitious! I tell you, each one is like a tiny, little ol’ breath of ice cream, so it doesn’t even count. Mmmmmmmmmmmmm…… I could eat one now……. Oh my gosh….they are adorable! Must get some. Mmm… With teeny ones like that, I’d have the whole box eaten in no time.